It would have been easy to design the Guggenheim Museum’s new Wright Restaurant, which opens to the public Friday, exactly as Frank Lloyd Wright himself would have wanted it: among the 400 drawings he made for the 1959 building, a few were devoted to a ground-floor dining space, though not one particularly suited to a contemporary audience. “The layout was very simple, almost monastic, with clusters of tables aligned with the portholes,” said the architect Andre Kikoski, who designed the restaurant. But, as he explained, “it wasn’t conducive to social interaction, and it certainly wasn’t about the integration of art.” Rather than executing Wright’s original sketches, Kikoski turned the space — most recently a generic cafeteria with brown carpeting — into a modern homage to the legendary architect, who designed the museum to harmonize with the artwork within. The Guggenheim commissioned one of Kikoski’s friends and neighbors, the artist Liam Gillick, to develop a site-specific piece that runs around the walls and up the ceiling. Made of extruded aluminum in shades of yellow and orange, it helps museumgoers make a connection between the restaurant and what goes on in the adjacent rotunda. But most of Kikoski’s efforts were spent attempting to evoke the movement of the building’s signature ramp — short of making diners seasick, of course — by exaggerating the arced perspective of the room and filling it with highly tactile materials. “The same way you view the art differently from different points in the spiral, what you see from across the space isn’t the same as what you see when you get closer,” he said. 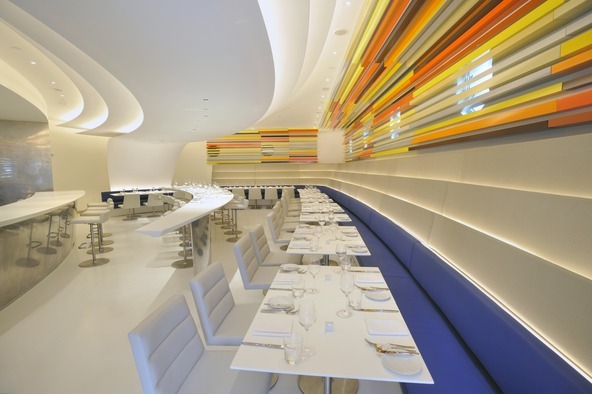 The wall behind the Corian bar is lined in fiber-optic wood; the metal bar front has a textured patina; and mesh stretched behind the blue leather banquettes is patterned with a tiny version of Wright’s “primitive initial,” the football-like shape of the rotunda’s columns and fountain, which formed the basis for Kikoski’s floor plan. Wright, whose many utopian fantasies were on view in the Guggenheim’s recent 50th anniversary retrospective, was never shy about embracing the future. It’s nice to see the museum thinks along the same lines.